“Fair trade is not about spending more money or buying more stuff. It’s about bringing justice to people around the world.” Fair enough. And as readers take Jones’ tour through the lands of fair trade and its role in social justice, they learn where things come from and go to. The story of fair trade is quite buoyant, because it is not just a pipe dream. As Jones notes in one of the numerous, captivating factoids that pepper the margins of the book, “fair trade products are now sold in more than 120 countries.” Numerous stock photographs bring a snappy immediacy to the story, as do Jones’ anecdotes of her own experiences with fair trade. Jones does a particularly good job bringing individuals to the fore so that readers can both identify with them and learn how these people can band together with other small producers into cooperatives to become a market force. “Ninety percent of the world’s cocoa is grown on small family farms by about six million farmers,” so it doesn’t take a math genius to appreciate that buying fair trade chocolate benefits a lot of people. 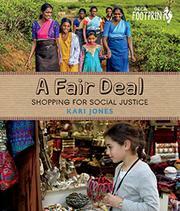 Jones also presents a handful of ways that kids can encourage fair trade awareness.